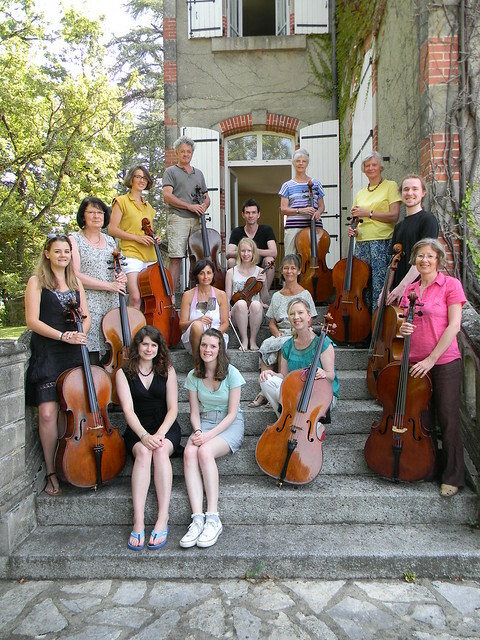 As ever, Cellos at Belle Serre has a superb team of professional musicians tutoring cello ensembles and chamber music, and assisting with a range of workshops throughout each week. 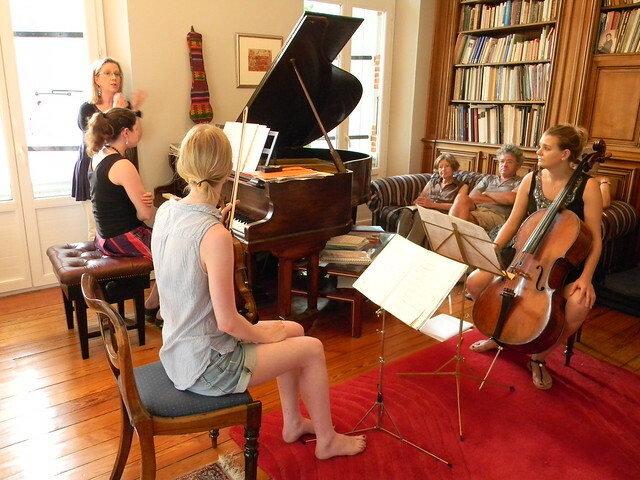 Last year’s new diagnostic Cello Clinic was hugely popular, and will be open during each course next summer. Bernard O’Neill will be back for further forays into improvisation for cellists. Lucy Robinson and Andrew Wilson-Dickson introduce us to the art of viol consort playing, and baroque sonata and continuo playing in Weeks 2 and 3. 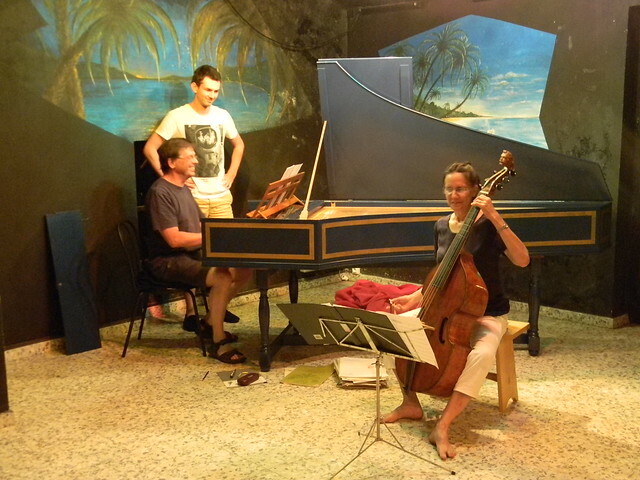 Last year at Belle Serre, Lucy and Andrew gave the first performance of Andrew’s new work for viol and harpsichord, and we all took part in the first performance of his Les Caulets, written for Cellos at Belle Serre, for the unusual ‘combo’ of cello ensemble, harpsichord and viol – it was a triumph, not least for the logistics of getting us all into one space to perform it! To keep our energy up for this cello immersion, I am delighted to welcome back our extraordinary team of culinary experts: Bob, Rob, Pierre, and Richard, aided by a super team of helpers. Here’s the week by week lowdown, just to give you an idea of our planned schedule. Watch this blog for updates of events in the summer calendar. Each week offers daily cello master classes with Lowri Blake, cello ensemble, chamber music for each cellist with professional players, cello lessons and working in small groups with one of our superb assistant cello teachers Willemijn Knödler and Susan Urbita, and cello and piano duo repertoire with pianists Pippa Harrison, Camille Galinier and Andrew Wilson-Dickson. 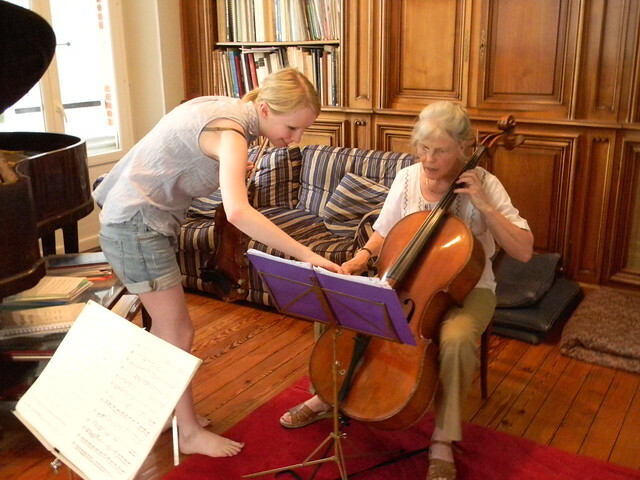 This week is for cellists of all levels, professionals and cello teachers, students and less experienced players too. Parts for cello ensemble playing are carefully allocated to suit your level. The superb Albany Piano Trio stunned us last summer with their performances of Shostakovich’s Second Piano Trio and trios by Haydn and Brahms. 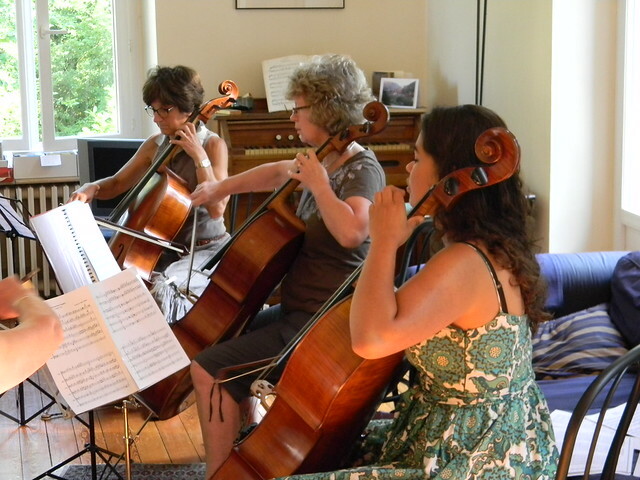 For Summer 2014 they are working on Dvorak’s Piano Trio in F minor, Opus 65, Debussy’s Trio in G and Haydn’s Trio No.21 in C.
Advanced players can choose to work on movements from these pieces, or other works which will be listed shortly, along with other trio works suitable for all levels of experience. (These will be listed in the general information e mail sent to each participant). You can hear the trio performing at the Royal College of Music in London on 30th January, after which the players are artists in residence at the prestigious Banff Centre in Canada. This week is also for cellists of all levels, professionals and cello teachers, students, and less experienced players too. Parts for cello ensemble playing are carefully allocated to suit your level. 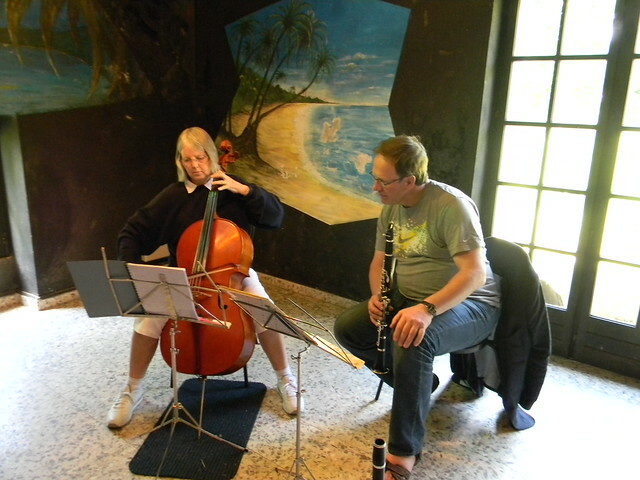 Clarinettist Mark Lacey of Harmoniemusik is a very popular performer and teacher on the Cellos at Belle Serre courses. Mark will be exploring trio repertoire for all levels of experience; in addition to the Brahms Op 114 and Beethoven Op 11 trios for advanced players, we’re looking at the trio version of Beethoven’s Septet Op 20, a movement from Zemlinsky’s Trio Op 3, and a wealth of intermediate and elementary trios (listed in the general information e mail to all participants) ranging from original pieces by Langford, Carse and Bridge, to popular and well-known pieces specially arranged for a variety of different levels – there’s something for everyone! Viola da gamba expert Lucy Robinson’s introduction to the viol and its repertoire is both absorbing.and enormous fun – don’t miss the opportunity to try playing one of her consort of viols, with music arranged for beginner viol players by Andrew Wilson-Dickson. And bring a movement or two of a baroque cello sonata to work on with Andrew, whose harpsichord will be in residence, and whose coaching on continuo playing and baroque repertoire is wonderfully illuminating. Week 3 is for advanced cellists, (music students, amateurs and professionals), who have excellent ensemble playing and sight-reading skills. Last summer’s performance of Villa-Lobos’s Bachianas Brasileiras No 1 was a tour de force, and this year we will be performing a selection of advanced ensemble works including Christopher Bunting’s Fanfare, Ode and Scherzo, Pablo Casals’s Les Rois Mages, Patsy Gritton’s thundering arrangement for six cellos of Rachmaninov’s wonderful Prelude in G minor, Op23 No 5, and a sparkling array of jazzy medleys compiled for Cellos at Belle Serre 2014. Andrew Wilson-Dickson is not only our pianist for the cello master classes this week, but also our baroque music specialist – our focus is on baroque cello sonatas and aspects of continuo playing with harpsichord. Once again, Lucy Robinson takes us through our paces playing viols for an afternoon of consort fun. Follow us on the Cellos at Belle Serre Facebook group for updates and on Flickr for our photo gallery. 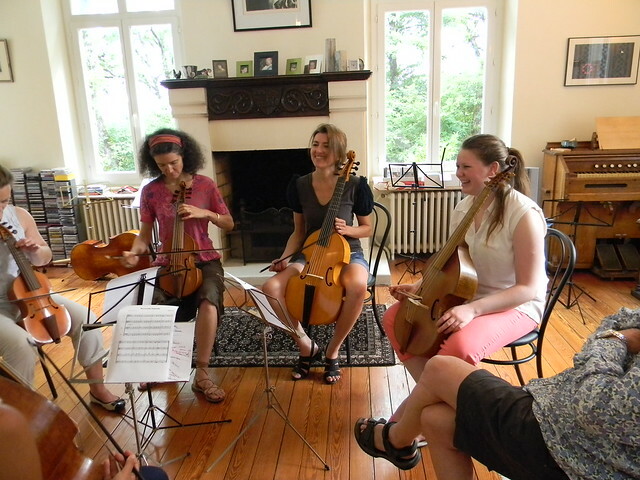 Hope to see you this summer at Cellos at Belle Serre!